It's been well over a year since I've posted to the blog, and for that I apologize. Something about the convenience of instagram, or the brevity of twitter, and add to the day to day act of designing and building things and often my most comprehensive means of communication, kem3D.com takes the hit. I'm not sure it will change any time soon, but for now, some site updates are in order, and a recap of what's been going on here at kem3D HQ. First off, and most temporally relevant, I have some new lamps on sale for the holidays at the Simone DeSousa Gallery in Detroit. I will also be part of the Holiday Maker's Market at Ponyride Detroit this Saturday, the 12th from 12-10. At the Maker's Market I will have lamps, ornaments, clocks, and table accesories for sale, stop by and see what Detroit's makers have to offer. So, what else have I been busy with since last May? Well, Wanted Design 2014 was a blast, and I learned a lot and made many connections. Kem3D part of the Detroit Made pop-up at Michele Varian in NYC, got a little press in an Austrian design mag called Holzmagazin, and set up with a holiday pop-up shop here in Detroit put on by the DC3. 2015 started off by getting married(!) which was the culmination of many months of planning in late 2014. On our first trip we headed off to nearby Toronto just in time to catch the first 2 days of the Toronto Offsite Design Festival. The first big project of the year was a commission piece for the new, award-winning Commonwealth-McCann office in downtown Detroit, which was designed by Gensler. 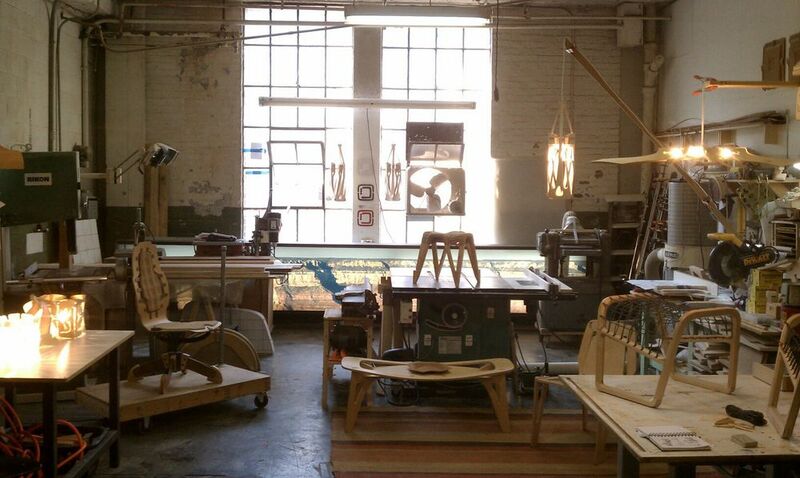 The middle of 2015 started off by traveling to Turkey and Greece, then eased into the development of the Interlocker Cafe Pendant and new Breakplane 3 table lamps. I also had work in the Detroit Made display at Wanted Design 2015, and designed my 10th and final piece to promote the annual Tour-de-Troit bike ride. I also created some new pieces for the Detroit Design Festival Market in September, which was great event, and look forward to being part of next year. And now, we will finish it off with the Ponyride Maker's Market this Saturday! If we go through a post drought like this again, keep an eye on @kem3D on Instagram, because if nothing else, I'm a sucker for the convenience of a snapshot. Finally, we hope you all have a warm and bright holiday season, a happy new year, and that we will see you more in 2016. I am happy to announce that I will be launching the Rand chair and Rand rest at the Wanted Design Launch Pad during New York Design Week this May 16th-19th. If you are in town, stop by, say hello, and see my newest work! Hi, I'm opening up the studio Saturday the 15th, along with other artists and craftspeople at the big and gritty Russell Industrial Center, where I've been making wood stuff in this space for 7+ years, so its nothing particularly new, but I'll have some gifty things and some not so gifty home furnishings for sale. More than anything, if you want to come by, hang out, and see where I make stuff, talk about tools or whatever, I'll be there. Just a heads up that my breakplane lights are available for purchase at See Art Design in Detroit, and Design Quest in Grand Rapids, MI They come disassembled (with assembly instructions) in easily shippable packaging. They make great gifts! In the flurry of activity getting ready for the Detroit Design Festival I was remiss in my blog-ular duties (not to mention during the entire month of August), but I would like to make everyone aware that my installation for the DDF is up until October 27th at See Art Design, (Re:view Contemporary's design oriented alter-ego) here in Detroit. Hours are Th-Sa, noon-6, or by appointment. "impliedsurfaceshelter" is a large scale exploration of traditional seat weaving as a means to divide the volume of a room through the dynamic, implied surfaces that the tension within the weaving creates. It is constructed from 2x6" lumber, plywood, and polypropylene strapping. ...Coming soon. I would just like to give a brief thanks to the fine folks at Michigan Box located here in Detroit for the great package design. Hey friends and followers, I've finally been able to spend some time updating and reworking the galleries, its a work in progress, so keep an eye peeled. ...Is the theme of this year's Annual Design Show at the Detroit Artist's Market that I will be a participating in. 2012’S DAM DESIGN SHOW will celebrate COCKTAIL! Thirteen local designers will share their own process of creating cocktail tables, side tables and bars, starting with sketches to the finished saleable product. During the exclusive Opening Event, DAM will once again host a runway show, featuring women’s cocktail evening wear by Emily Thornhill of Homeslice Clothing. here is a teaser of what I'm working on for the show, hope to see you there! Knight Arts stopped by Re:View Contemporary for the Re:Collect 2011 show an shared their thoughts here: "All about the details"
These are more process pictures of the pair of stools that I am making for the Re:collect show Re:View Contemporary. Our last installment showed the basic pieces cut out and some of the upper joinery cut. Following that was a lot of hand work to tune the joint's fittament, gluing, cutting and designing the joinery for the lower end of the pieces. Following that, assembly, shaping, beveling, sanding, drilling and finishing, oh my. Enjoy, next week I'll have some pictures of the pieces with the seats woven in.